168 BC Antiochus outlaws Judaism. Jewish sacrifices at the Temple are abolished. Pagan corruption and desecration of the Temple and the religion of Judaism rapidly accelerates. 167 BC The Abomination of Desolation (Zeus/Jupiter), a naked statue of Zeus endowed with an erect, oversized phallus, is deliberately placed upon the altar in the Temple. In retaliation, a former priest named Mattathias the Hasmonean begins the Revolt of the Maccabees. 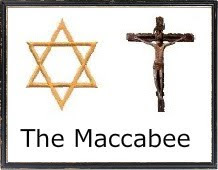 165 BC (Later that same year) In celebration of their improbable victory over the Greek Empire, Judas Maccabaeus institutes a new religious festival called Hannkah (Dedication) to be celebrated every year by lighting candles for 8 consecutive days. The holiday has now been celebrated by Judaism for over 2,000 years.